The challenges of being discovered for an indie dev. Last week, acclaimed developer Housemarque announced that it was moving away from arcade shooters, following a so-so commercial performance of the excellent Nex Machina. It made me wonder that if a high-profile developer that's been making them for that long to so much acclaim is struggling to make its games financially viable, what about everyone else working in similar genres? Santeri 'RELLU' Relander runs Finnish indie developer Still Running Games. In late September, the studio released its second game, The Walking Vegetables, an '80s-infused twin-stick shooter where you fight off mutated veg-based enemies. 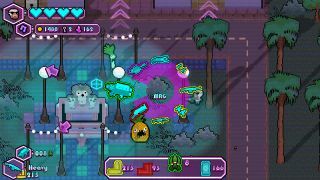 It's a vibrant-looking, responsive shooter, with a colour palette and imagery that recalls Hotline Miami, plus it's got local co-op and a slew of weapons with which to fight mutated vegetables. It's a deeply competitive genre, though—one that features the likes of Nuclear Throne or Ruiner, where developers already have substantial followings or in some cases, highly visible publishers. According to a Facebook post from Still Running that appeared in early October, the launch sounded tough, and sales came in below their expectations. "We went to a proper dinner that day, we had fun," Relander said, describing the game's launch day. "And then, the next day [we] came in. Yesterday's stats were handed over. And all of a sudden, it felt like everything was falling apart. I'm not going to list out any numbers, but let me say this. I'm not 100% sure anymore if we can continue making games as a team." "It’s definitely a rough patch that we’re on with the team right now, but I believe we’ll get through it," Relander tells me now. "Community, and the players are very important to me. And with The Walking Vegetables, we want to give the community a bigger chance to really affect the future of The Walking Vegetables. I’ve read all comments through social media, YouTube, Twitch, and of course, Steam, and I’ve been making changes and improvements into the game based on what people have been saying." Relander got started making games after watching the live-action 101 Dalmations movie, in which Jeff Daniels' Roger character is seen creating a game starring his dogs (a dream job, really). He first got access to a PC in 2005. "I found some smaller engines like Click&Play, Games Factory, RPG Maker, and FPS Creator, which I used of them all. FPS-Creator was my favourite back in the day, but soon the limitations of glorified level editors started limiting me." By 2007, he was learning Game Maker with a friend, and with it he created his first commercially released game, Zombie Kill of the Week, which he first prototyped in 2010 then worked on for six years, eventually creating three different versions. The Walking Vegetables, meanwhile, grew from being a month-long mobile shooter project to something larger after Vaasa Game Days 2016 in Finland. Relander's Facebook post suggested that he was searching for jobs, though, which speaks to the tough nature of indie development. "As for the Steam launch, neither of those games were a breakthrough, or a major success," when I ask Relander about Zombie Kill of the Week's sales figures versus his newest release. "Both did pretty much the same (as far as I know. I haven’t really seen much of numbers, as that’s not something I care about too much). Fingers crossed that The Walking Vegetables will one day bring us food to the table, and we wouldn’t need to worry about money." Thinking about Still Running's launch makes me think about the challenges of being discovered on Steam. Actually, my first thought is that the name The Walking Vegetables, while describing the jokey enemies you face in the game, is awkward to say—it doesn't tell the story that this is an intense 2D twin-stick shooter, or that it has an '80s aesthetic, and names like Helldivers or Nuclear Throne roll off the tongue a lot easier. But discoverability is the main issue, and it's something every developer is affected by to some degree. With new Steam releases this year set to reach 6,000, that's an absurd amount of product. For context, that's over three times the amount of PS2 games ever released in the United States (around 1850, according to our friends at GamesRadar). We previously featured The Walking Vegetables in our 'Five new Steam games you might have missed' weekly feature, which itself exists to sort through the monster pile of games landing on Steam every week. "There are a lot of games out there, many of which are good, and at least as many that aren't," Santeri says. "That of course depends on who you ask. But all in all, I think it is now harder than ever to get noticed. The world of the internet tends to be very random at times—some games get a lot of attention for going viral because of something random, and then a lot of good games that had good marketing may not ever get noticed. I don’t quite understand how it all works, but then again, I’d assume no one really understands what works and what doesn’t, and why." That's the tough reality of indie development that most of us probably don't spend loads of time thinking about. You can spend a year of your life or more making your dream project, and a one-person smash like Stardew Valley is still lightning in a bottle—impossible to replicate. Success is determined by all kinds of factors that can't be controlled. In the near future, Still Running is working on adding new weapons and enemies to The Walking Vegetables by having the community vote for their favourites. "This game was made from scratch to accept new content in as easily as possible (comparing four hours for adding one weapon in ZKW, to around two minutes of adding a new, unique, weapon into The Walking Vegetables) and the game was made that in mind, that we’d be working on this for years to come. Right now, that scenario does seem a bit out of reach, but it’s still been just one month from the release. Fingers crossed that something will happen, and people start noticing the game more." I ask Relander where the name 'Still Running' comes from. "People have told me that making games isn’t work, and what I'm doing is stupid," Relander says. "And yet, I’ve been doing this for the last ten years of my life. It’s basically me saying that I’m still here. I’m still doing what I love. I’m Still Running."